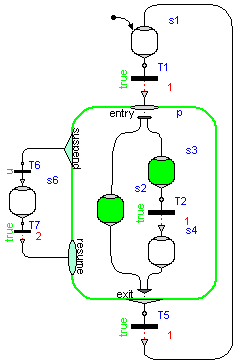 Library Modelica_StateGraph2 is a free Modelica package providing components to model discrete event, reactive and hybrid systems in a convenient way with deterministic hierarchical state diagrams. For convenience, the abbreviation "StateGraph2" will be often used for this library. An example model constructed with this library is shown in the figure to the right. This library is inspired by Grafcet/Sequential Function Charts (SFC), Statecharts, Safe State Machines (SSM) and Mode Automata, and utilizes Modelica as action language. It has a similar modeling power as these formalisms, e.g. synchronization of parallel executing branches as in SFC (not easy in Statecharts), or suspending a hierarchical subgraph with one transition and resuming at the same states afterwards when entering it again, as in Statechart (not possible in SFC). A StateGraph2 model is always deterministic due to Modelicas "single assignment rule". Via special blocks in subpackage "Blocks", actions can be defined in a graphical way depending on the active step. In order to construct a new state machine, exactly one instance of either "Step" or of "Parallel" must have parameter "initialStep = true". The "Parallel" component is both used as "composite step" (so only one branch), as well as "parallel step" (so several execution branches). The branches can be synchronized (if parameter use_outPort = true) or can run unsynchronized to each other (if parameter use_outPort = false). Tutorial provides an overview of the library inside the User's Guide. Examples provides simple introductory examples as well as involved application examples. ComparisonWithStateGraph1 summarizes the enhancements with respect to the previous version of Modelica.StateGraph. This library is implemented with Modelica 3.1 and utilizes non-standard extensions to Modelica 3.1 as summarized here.